In addition to click-trading in MD Trader using a mouse, you can use the keyboard to make trades. Enabling keyboard trading provides an alternative for entering orders and does not disable the mouse. To globally enable keyboard trading, you must enable hotkeys in the Hotkeys tab in the Properties menu. On the Menu bar, select Setting and click Properties. The Properties menu display. In the left-column, select Hotkeys. In the Hotkeys Assignment section, enable the checkbox next to MD Trader. Optionally, expand the plus sign (+) to configure new hotkeys for each trading action. In addition to the global functionality, X_TRADER 7.17.30 and higher allows users to enable/disable keyboard trading on individual MD Trader windows as described in the section Keyboard Trading on Individual MD Traders. Warning: Changing the Global Hotkeys setting does not change the behavior of any opened MD Trader windows. X_TRADER 7.17.30 and higher include an enhancement that allows users to enable/disable keyboard trading on individual MD Trader windows. Right-click the MD Trader window and select Properties. In the Order Entry section of the MD Trader property screen, enable/disable the Enable keyboard and function key trading checkbox. Keyboard trading is disabled by default. You do not need to enable the keyboard to perform some functions in MD Trader. Refer to Unrestricted Keyboard Functions. 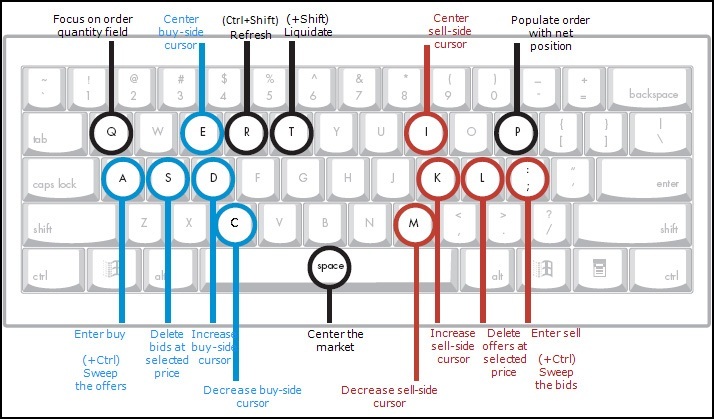 For a map of MD Trader keyboard functions refer to Keyboard Trading in MD Trader. You can change the hotkey associated with mapped keys. Refer to Changing Hotkeys in MD Trader. 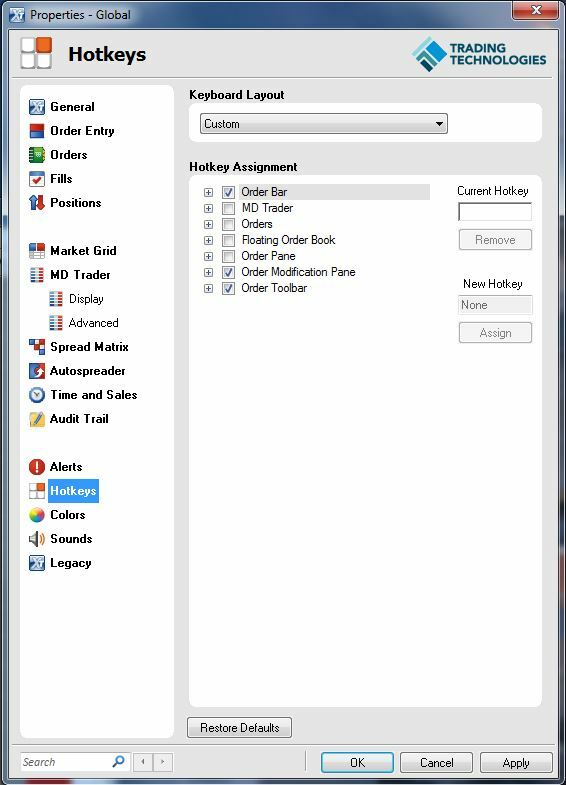 In the Hotkey Assignment section, click to select MD Trader. You can change the hotkeys associated with commands in MD Trader using the Hotkeys tab on the Properties menu. Note: You must enable keyboard trading to use the hotkey commands. Refer to Enabling Keyboard Trading in MD Trader. In the Hotkey Assignment section, click MD Trader. In the Hotkey Assignment section, click the "+" next to MD Trader and select which hotkey to change. Click in the New Hotkey field. Certain keyboard functions can be used with or without enabling keyboard trading. Note: This does not refer to the number keypad. Enters the order quantity in the Order Quantity field. The P key Loads your current position in the Order Quantity field. The Spacebar Centers the grid. The up arrow Scrolls the grid up. The down arrow Scrolls the grid down. The Page Up key Pages up. You may no longer see available prices because it paged up too far. The Page Down key Pages down. You may no longer see available prices because it paged down too far. In MD Trader once keyboard trading is enabled, you can combo dime the bid and offer. Note: You can change the hotkeys associated with these commands. Enable keyboard trading. Refer to Enabling Keyboard Trading in MD Trader. MD Trader enters a sell order one tick better than the current best offer in the market and a buy order is sent one tick better than the current best bid price in the market. The quantity sold is based on the amount in the order quantity field or on the preset default order quantity. In MD Trader once keyboard trading is enabled, you can combo join the bid and offer using the keyboard. MD Trader enters a sell order at the current best offer in the market and a buy order is sent at the current best bid price in the market. The quantity sold is based on the amount in the order quantity field or on the preset default order quantity. In MD Trader once keyboard trading is enabled, you can delete all orders, working bids, or working offers using the keyboard. In MD Trader once keyboard trading is enabled, you can dime the bid using the keyboard. MD Trader enters a buy order one tick above the current best bid in the market. In MD Trader once keyboard trading is enabled, you can dime the offer using the keyboard. MD Trader enters a sell order one tick below the current best offers in the market. In MD Trader once keyboard trading is enabled, you can enter a buy order using the keyboard. Press the D and C keys to select the desired limit price. Press the Q key to focus keyboard entry on the Order Quantity field. Type in the desired quantity of the buy order on the keypad. Press the A key to send the buy order. In MD Trader once keyboard trading is enabled, you can enter a sell order using the keyboard. Press the K and M keys to select the desired limit price. Type in the desired quantity of the sell order on the keypad. Press the ; key to send the sell order. In MD Trader once keyboard trading is enabled, you can enter the order quantity using the keyboard. Press a numeric key on the keyboard. A cursor appears in the Order Quantity field. It is possible with keyboard functionality enabled to use a game pad control, which emulates keyboard key presses. In effect, using a gamepad maps the buttons on the gamepad to specific key strokes on the keyboard which, in turn, are mapped to specific MD Trader functionality. The gamepad plugs into the keyboard port on the workstation. Warning: Trading Technologies has tested gamepad functionality in connection with keyboard mapping using a product by Suncom. Trading Technologies will not provide instructions on how to set up the gamepad with a keyboard nor does the company support users who do attempt to use this add-on in their trading. Traders wanting to use this functionality are encouraged to contact the gamepad manufacturer for specific instructions on how to connect this add-on to their system. In MD Trader once keyboard trading is enabled, you can "hit the bid" using the keyboard. MD Trader enters a sell order at the current best bid in the market. The quantity sold is based on the amount in the order quantity field or on the preset default order quantity. In MD Trader once keyboard trading is enabled, you can join the bid using the keyboard. MD Trader enters a buy order at the current best bid in the market. The quantity sold is based on the amount in the order quantity field or on the preset default order quantity. In MD Trader once keyboard trading is enabled, you can join the offer using the keyboard. MD Trader enters a sell order at the current best offer in the market. The quantity sold is based on the traders current position or on the preset default order quantity. In MD Trader once keyboard trading is enabled, you can load the net position in the Order Entry field using the keyboard. The Order Entry field is populated with the net position (in order to go flat in the market). In MD Trader once keyboard trading is enabled, you can enter a market order using the keyboard. The only time in force supported is a Good Till Day (GTD) order, and the only order restriction you can use is Immediate or Cancel (IOC), available from the button in MD Trader. The quantity sold would be based on the amount in the order quantity field or on the preset default order quantity. In MD Trader once keyboard trading is enabled, you can set the limit price (position of the cursor) for either the buy or sell side with the following keys. In MD Trader once keyboard trading is enabled, you can sweep all the buys or sells up to a point set by the buy or sell side cursor using the keys listed below. How deep you can sweep the market depends on the level of price depth set by the exchange. Use a combination of the D and C keys to set the position of the buy side cursor. Use the combination of the Ctrl and A keys to sweep the offers up to the price level indicated by the buy side cursor. Use a combination of the K and M keys to set the position of the sell side cursor. Use the combination of the Ctrl and :/; keys to sweep the bids up to the price level indicated by the sell side cursor. MD Trader enters a buy order at the current best offer in the market. The quantity sold is based on the amount in the order quantity field or on the preset default order quantity.